Who is excited that it is finally summertime?! I am! Kind of. It has been incredibly warm down here in Florida since, like, January. It's basically a permanent summer down here! Which is why I am so excited to partner with Coca Cola today: Coca Cola has been there during some of my favorite summer memories with my family. 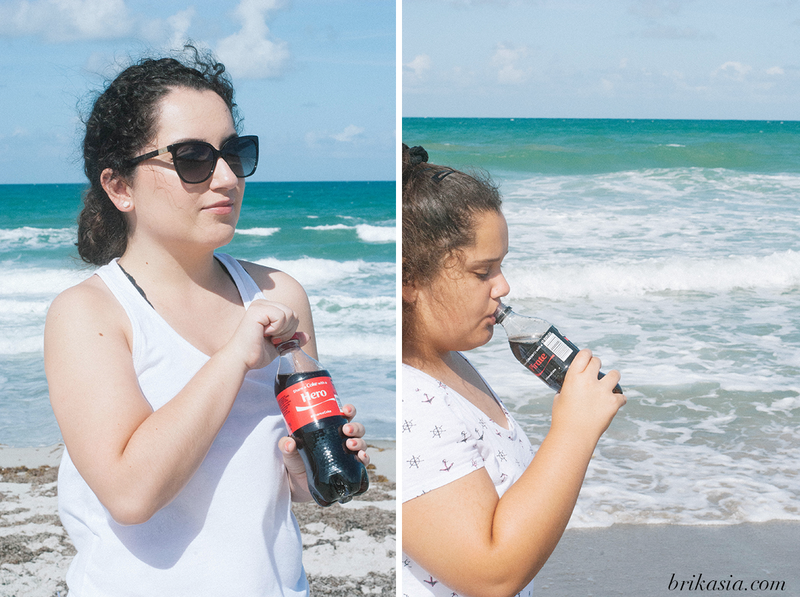 So it was only appropriate to #ShareACoke with one of my favorite people in the world, my little sister, to create some new summer memories this year. Before any summer memories can be created, it's important to stock up on some essentials at Walgreens. And here's a fun little fact for you guys: Every Wednesday through Friday from 4:00 to 7:00pm, buy 1 Coca-Cola 20 oz. bottle and get 1 Free 20 oz. bottle to share! You can load the coupon instantly on the Walgreens app or click here for more information. 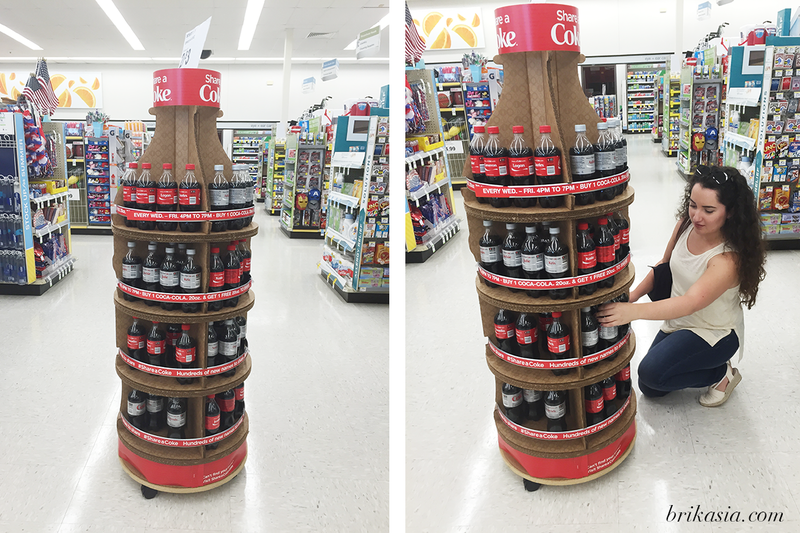 I visited several Walgreens locations near me to find the perfect bottles for my sister and I, and each one had these awesome Coke displays that make finding your perfect bottle even easier! And here's another fun fact: May through July you get 3,000 Balance Rewards points when you buy participating Coca-Cola products when you purchase $10 of participating Coca-Cola products. Awww, yeah, ya'll. 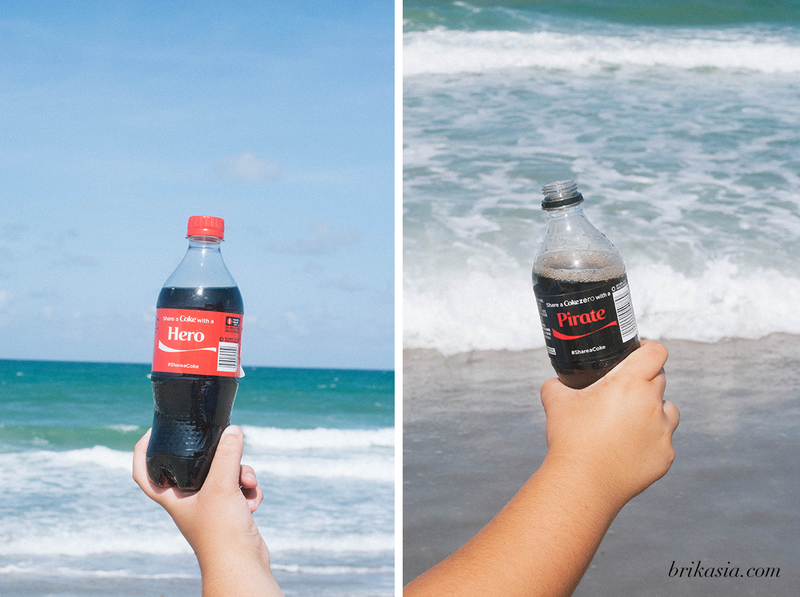 I found two super awesome #ShareACoke bottles- one with "Pirate" on it, and the other with "Hero". Naturally, I kept the Hero one for myself because we all know I'm my little sister's hero. ;) :P (I bet she's rolling her eyes right now if she's reading this!) I gave my sister the Pirate bottle because really, is there anything cooler than a pirate? I think not! Since we live right by the beach, most of our summer memories involve frolicking in the sand and the water. Since my sister is still in high school, we've made it a priority to go to the beach after I pick her up for some quality sister time. After picking up our bottles of Coke, we head to the beach and get ready for a good time. Stay cool. Especially if you're hanging out at the beach all day, bring some sort of shade with you, like an umbrella or mini tent. I don't know about you, but staying in the blazing sun all day gives me a headache, and that's one way to ruin the fun beach vibes! Stay refreshed. Pack a mini cooler and bring some of your favorite summer refreshments to the beach with you- like Coca-Cola! Walgreens is a great place to stock up on everything you need for a beach day. Slather on the SPF. Seriously guys, skin cancer is no joke. Don't lay out in the sun without properly bathing yourself in sunscreen. Especially if you'll be out in the water- it's so easy to forget to reapply SPF and get a nasty sunburn. Keep an eye out on the weather. If it's a super windy day, chances are there is a high chance for rip currents, which are extremely dangerous. Be careful when you're in the water, and never swim alone. This past Memorial Day weekend, over 500 people had to be rescued from rip currents here in Florida. Check to see if there are any flags up at the beach. If you see a red flag, then the chance for rip currents are high. If you see a purple flag, then there are dangerous marine life close to shore (like jellyfish- yuck!). Just relax and have a good time. I mean really, with a Coke in your hand, and your family spending time together, how can you not have a good time at the beach? So guys, what are some of your favorite things to do at the beach? And of course, who will you be sharing a Coke with this summer from Walgreens? PS- for more information on the promotions at Walgreens, click here! Love your beach photos! 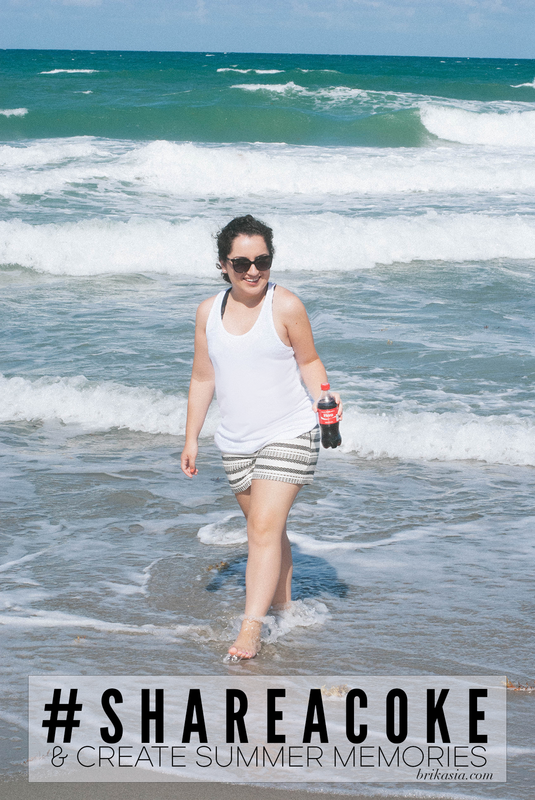 Perfect beach day + Coke=enjoy! Your pictures at the beach are fabulous! Great tips too! I can think of no better drink at the beach other than a cold Coke! LOL! I've never seen a PIRATE one before! I am pretty sure they won't have my name so I will take PIRATE instead! Oh I love your beach photos. very relaxing! Cherry Coke Zero and Vanilla Coke Zero are my weakness! They're the only sodas that I like to drink. I would love a pirate bottle! The beach photos look amazing. 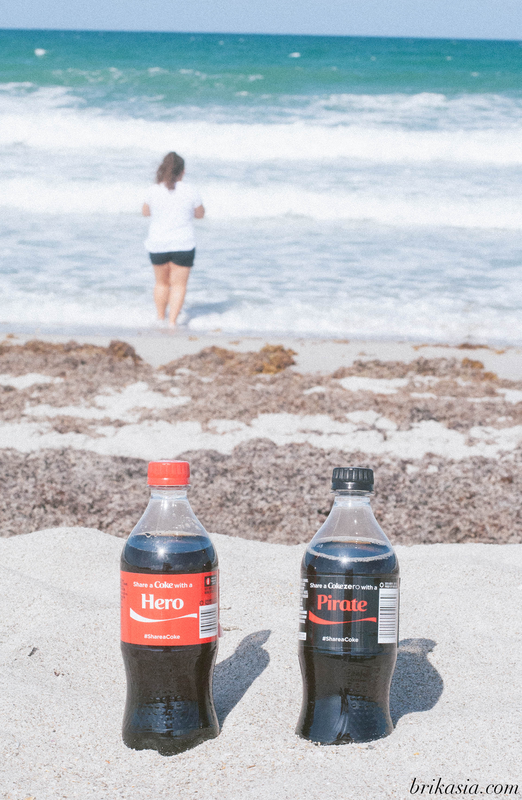 I love that they have fun labels (like pirate) for those whose names are never on things, and, now I totally want to head to the beach! How have I never seen the Pirate one?!?! It's awesome you get to spend so much time with your sister. My sister is still in HS too, but lives halfway across the country, so I only see her once or twice a year.